Admit it! You're in love with your Jeep. Well, who isn't? The essence of the Jeep experience - excitement, fun and adventure - can't be expressed in words. Is that experience being hindered by the height of your dream vehicle - making it difficult to get in and out? When you feel adventurous and take the bumpy trail, are your passengers being dangerously bounced around with nothing strong and comfortable to hold on to? 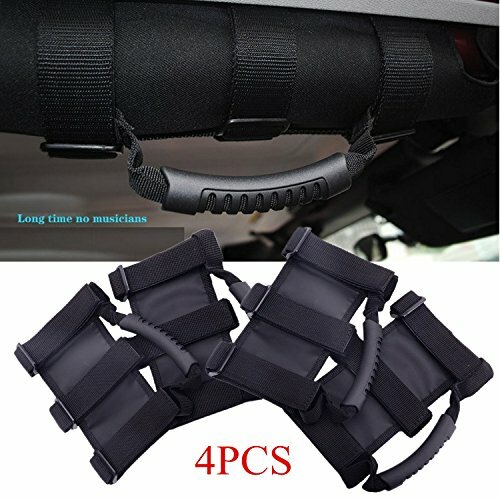 What you need is a safe grab handle enabling you easy assistance in and out of the vehicle, or holding yourself in place while bouncing down the trail. Ridge Fit Roll Bar Grab Handles are made just for that. The 3 strap design holds the handle securely in place and supports heavy weight, while the contoured handle assures a firm yet comfortable grip. Everything you put on your Jeep should match your Jeep with look, feel and quality. Our grab handles are made of high quality nylon webbing and industrial grade Velcro. With durable construction and weather resistant properties, they are second to none. That's why, we stand by our quality promise with 5-year FREE replacement warranty. Don't let the absence of strong, secure grab handles hold you back from experiencing the thrill. Click the Add to Cart button to take advantage of this limited time offer for the top rated Jeep assessory and get ready for safer adventures, amazing memories and happy joyrides. Tough Nylon,easy to install, Fit well around a padded roll bar. If you have any questions about this product by Bentolin, contact us by completing and submitting the form below. If you are looking for a specif part number, please include it with your message.